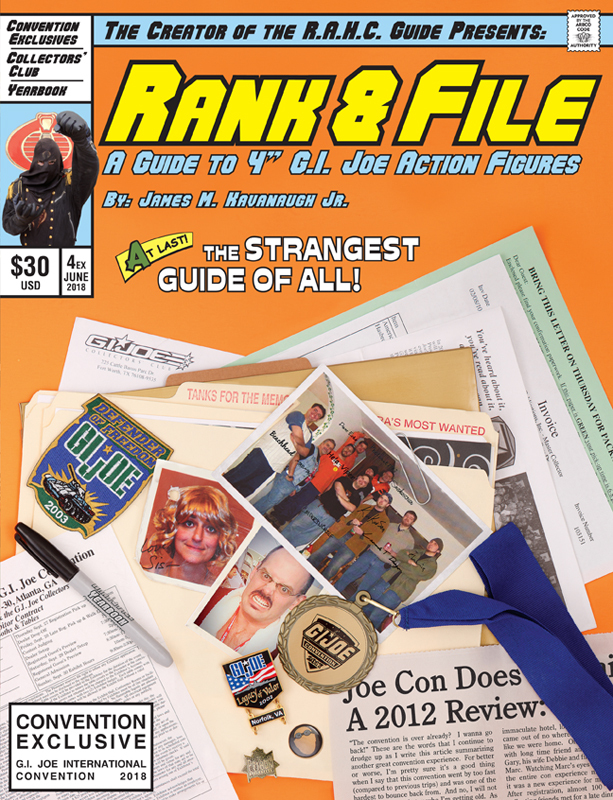 Rank & File vol 4, the latest in a series of amazing reference guides from “Noted Author” James Kavanaugh, will make its debut at this year’s final GIJoeCon! The adventure continues to evolve in Rank & File — A Guide to Third-Generation 4” G.I. Joe Action Figures! This time with a alternate convention exclusive cover! The Rank & File guide volume 4 is the first in a two-part series displaying every G.I. Joe action figure produced as a convention exclusive and for the G.I. Joe Collectors’’ Club, complete with every accessory and variation produced. Not only are the accessories shown, they were carefully cataloged in an upcoming volume that will guarantee the proper shade of accessory goes to the appropriate action figure. 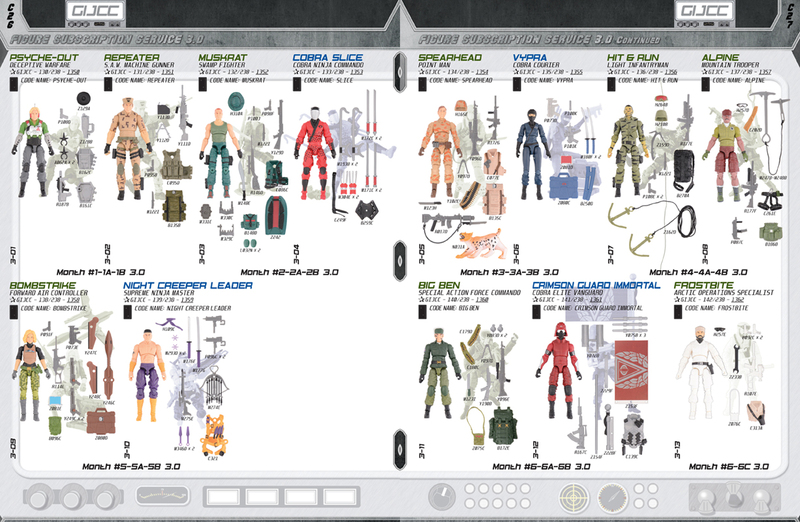 To top it off, every vehicle and playset released in the 4″ era is documented in the Rank & File series and every easily removable piece is shown individually photographed —ensuring collector completion. 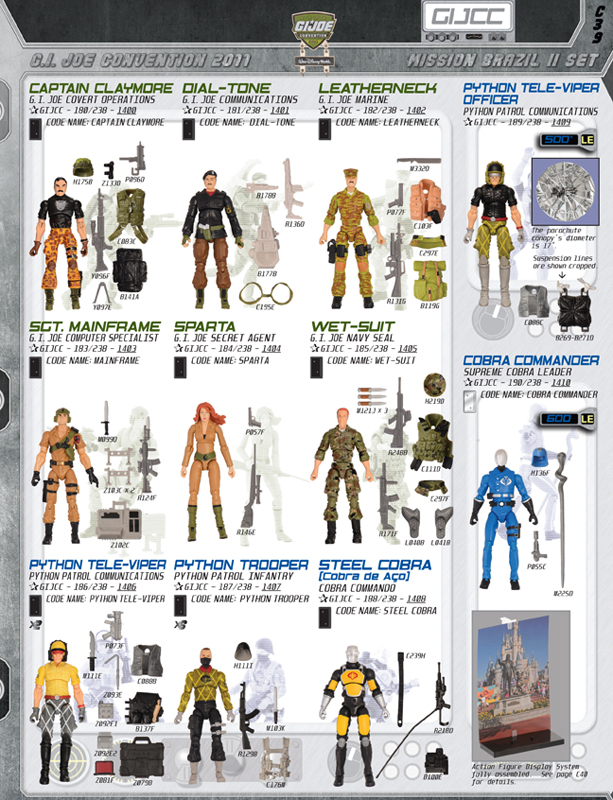 This full color, fifty-two page resource manual beautifully illustrates supplemental avenues’ 166 action figures, twenty-eight vehicles, and every accessory, including all known variations. Not only is every accessory present and accounted for, they have each been assigned a unique number and identified throughout the resource guide. Each action figure was carefully examined between its initial run and any further re-releases to ensure accurate samples are clearly and concisely presented, perfect for the collector who is identifying individual action figures or sorting through unorganized lots. Rank & File’s volume 4 will debut at 2018 International G.I. 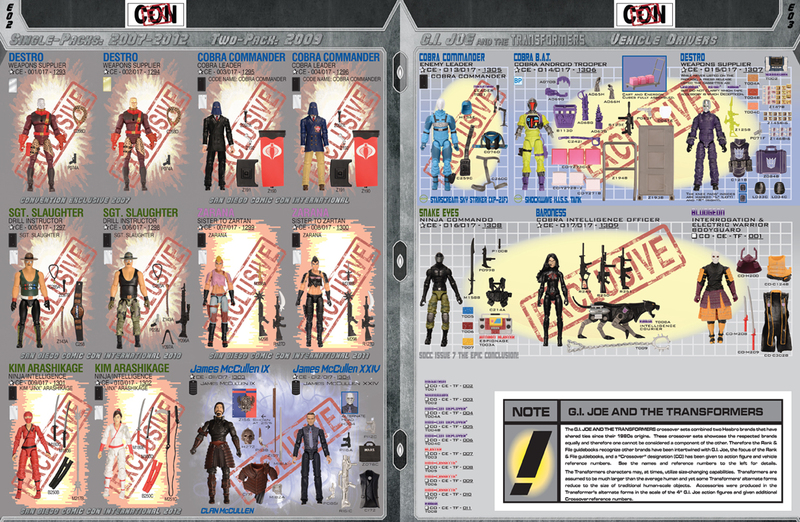 Joe Collectors’ Convention in an exclusive format! 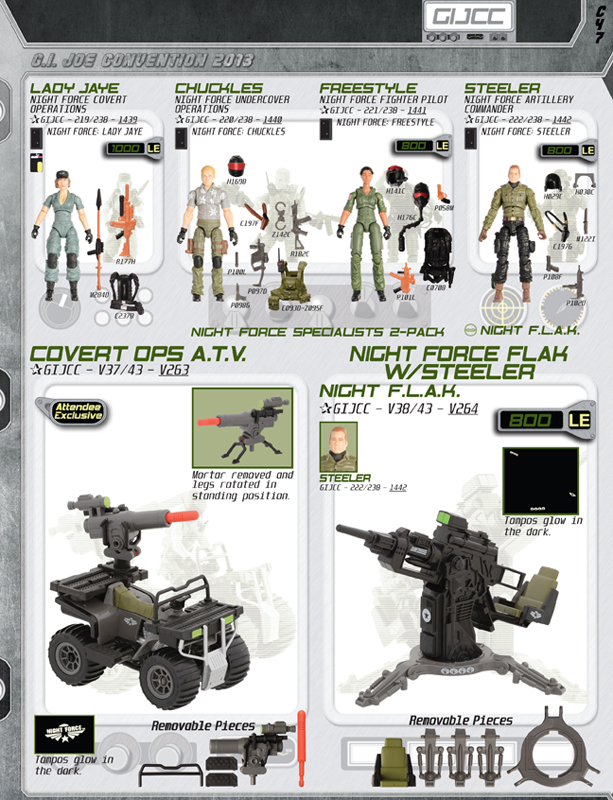 This resource guide will include an exclusive convention-themed G.I. Joe YEARBOOK cover, three pages sharing memories of past conventions, three blank pages for attendees write parting goodbyes with their exclusive Rank & File custom sharpie. 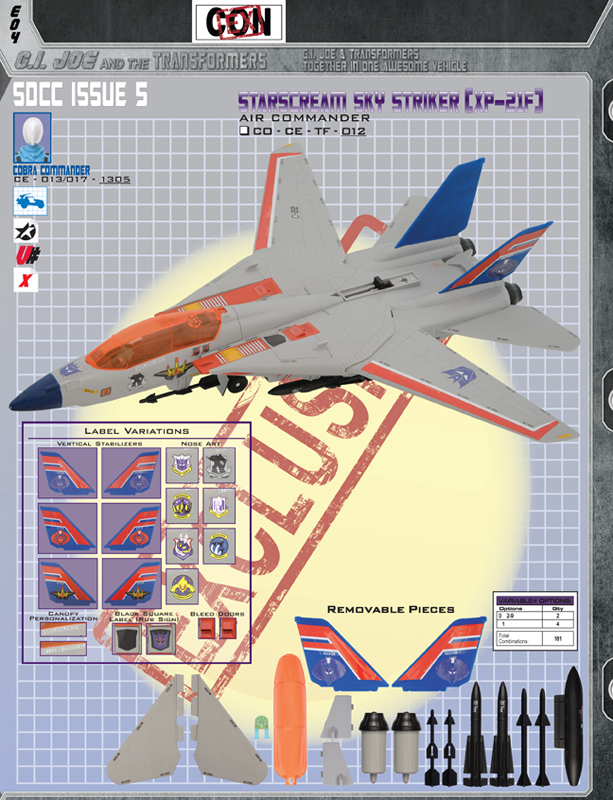 These exclusive features will be a limited format and not included in the standard forty-eight page volume 4 release. Don’t miss out!! See you at Joe Con!!! The MSRP for The Rank & File guide Volume 4 convention exclusive is $30 and available at the 2018 International G.I. Joe Collectors’ Convention. Any remaining stock will be available on the website, www.rahcguide.com, and buyer will pay all additional shipping and handling costs. If you have purchased the R.A.H.C. guides before, the process will be very similar. This guide was self-published and produced in quantities reflecting previous sales so do not hesitate in ordering if owning a guide is a priority. The standard release will be made available in the summer 2018. Keep checking the website for updates! I can’t say it enough — I LOVE these books! Seriously- mad, crazy, obsessive love for each and every volume in this series. The reason is simple: James does such an incredible job of detailing each and every figure right down to the baton, microphone, or single bullet accessory! I was already down for vol 4 when he first discussed it on an episode of Just Another G.I. Joe Show but the reveal of this exclusive “yearbook” version just pushed my need to own it right over the top. The homage to G.I. Joe : A Real American Hero, vol 1 #26 is inspired and the inclusion of yearbook-style signature pages for attendees at this year’s final GIJoeCon makes it all the more essential. It’s not just a reference guide– it’s a love letter to an event that has brought so many fans together over the past 21 years. Run, don’t walk to the RAHC Guide table at GIJoeCon this year and snag a copy of Rank & File vol 4 in person. Or, if you’re not attending, keep your eyes peeled to the social media channels and website mentioned above to snag your own copy when they go up for order. 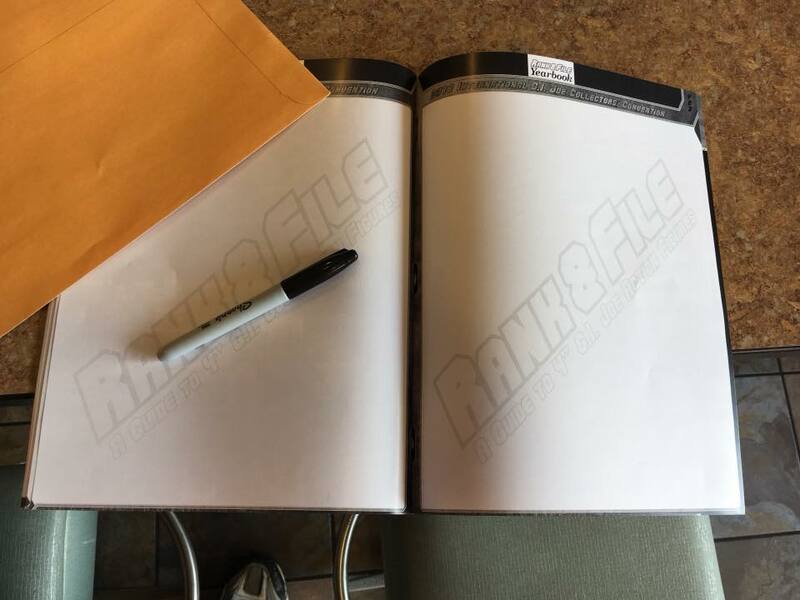 Rank & File vol 3 is coming soon from James Kavanaugh! Rank & File vol 3, the next installment in the ultimate modern G.I. Joe reference series, is coming soon!